Wow, it looks bad. Usually the issues are confined to the headline, but the filth filters right through to the cave floor this time. It is hard to imagine a report that diverges more radically from every other employment measure over the last month. We’ve seen the report become politicized and lose some of its validity at the headlines, like the Unemployment Rate, but usually the details paint a different picture. Not this time. The only two positives were the number reporting as “Unemployed.” That total fell by 195k. The other was the Private Sector total which tallied 147k, 9k higher than the headline of 138k because the government shed 9k for May. That’s some perspective on how bad this report is, 147k for the Private Sector counts as “good” news! The balance of the Blue World key indicators including Labor Force size, Participation Rate, total Employed, and Not in Labor Force moved the wrong direction and in almost implausible magnitudes. This will likely have an impact on the Labor Market Conditions Index, which updated and revised to the North at the beginning of last month. We released an update based on that, and we will do so again next week if warranted. Hours and wages are uninspiring. This report coupled with the inflation reports of the past month should assure a current victory for the doves at the Fed, so don’t look for any additional rate hikes coming out of the next FOMC meeting. What does it mean for the direction of the economy? There are so many balls in the air, Russian ties, Paris Accord, Travel Ban litigation, to name just a few headliners. The ones not getting a lot of play are the regulation roll-backs occurring. If you’re wondering why the markets continue to run in all this turmoil and uncertainty we can look there. Congress hasn’t gotten much done, but restrictions and burdens on business are being reduced at a very brisk clip. If anyone in a position to impact that process is listening, we need to add the Fiduciary Rule to the list of evils that need to be vanquished. 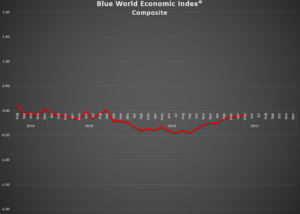 Here is a link to our first ever podcast for the Blue World Economic Index® report released yesterday. It, also, has some interesting findings, including on employment. Matt will be live discussing some investment ideas and market conditions on CBS Chicago’s “Noon Business Hour”, AM780 and 105.9FM, on Monday at about 12:50p Central. Interesting times, indeed. We’ll keep an eye on it and report back here next month! There is no doubt that the BWEI® and, therefore, the economy are moving, but in a rather unusual situation, May 2017 is a little skewed by some quarterly review and revision of the short and long term trends. Because we assign more weight to the trends than we do individual report data points, revisions here can have a seemingly dramatic effect on the Composite if there are more than the usual upgrades or downgrades in a given month. Such was the case this month. That’s good in that it means some positive trends that we just couldn’t deny any longer are developing but we should not get over excited knowing the disproportionate impact of multiple trend upgrades in a single month. Caveats in place, let’s break it down. Real Estate took a bit of a drubbing in May 2017, dropping .17 from .31 to .14, mainly from a big drop in Construction Spending and a long-term downgrade to Existing Home Sales. The other seven reports for this category held up just fine. For the first time since the election, Consumer measures gave a little back. This was not, however, on the backs of the direct metrics of Sentiment, Comfort, and Confidence. It was more from the indirect reports such as Vegas Strip Gaming Revenues or the Gallup ECI being less strong. General Measures and Inflation were unchanged for the month but within Inflation, Farm Prices and the Employment Cost Index are hinting at some pressure. Good to see. Employment, Retail, and Services all showed some gains although the bump in Retail was modest and against a very low bar after April. The improvement in Employment is certainly taken more seriously in light of today’s ADP report. Let’s hope the BLS follows suit tomorrow. So, what’s the huge news? If you’re counting you already know it is Manufacturing! The Fed Sub Group is still ginormous and growing with some trend upgrades. But, as we’ve said, much of those are anecdotal, survey-driven reports. We need to see some movement in the hard data to validate the optimism. Well, SOME showed up last month in that three out of six current reports posted positives with a positive overall average. Folks, it’s been a long time since that’s happened! In addition, the short and long-term trends of some of the non-Fed reports, like Factory Orders, commanded their short and or long-term trends be reviewed. All this yielded a pop of .37, taking the Manufacturing composite from -.18 to +.19. That’s what vaulted the overall Composite Index to a .05 jump versus what would have been closer to a .03 advance. Both scenarios are good and leave the final reading for May 2017 at -.07, up from April’s -.12. Blue World Jobs Report Analysis will be out tomorrow. See you back here when the calendar says July!